Waiting for 'Superman': Are Teachers the Problem? In an episode of the 1950s TV show Superman, a school bus full of kids is threatened with disaster as it nearly topples over a cliff, when  whoosh  the Man of Steel flies in and pushes the bus to safety. 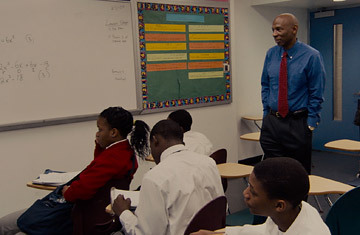 That was the fantasy that Geoffrey Canada, the South Bronxbred boy who became a Harvard-trained education entrepreneur, hoped for as a child. All it would take to save schoolkids was muscle and a miracle. But America can't exist on muscle anymore. With manufacturing jobs a sliver of what they once were, and field-level farming jobs largely stocked with immigrant labor, the coming generation of middle-class and working-class Americans needs not strong backs but educated minds. The titans and geniuses, the Warren Buffetts and Mark Zuckerbergs, will still propel themselves from privilege to power. What we need are people to work behind the counter at Southwest, to keep a million offices purring efficiently, to oil the machinery of civil service. A blue-collar economy is yesterday; a white-collar one is today and tomorrow. Americans also can't afford the fantasy that we have the world's best educational system. The U.S. is near the bottom of advanced countries in math and reading scores. We may not pass sleepless nights worrying about Finland, but that country's kids get a world-class public-school education, and ours don't. Our problems are bigger and more systemic: that, in the world's richest nation, a seventh of our citizens live in poverty; that the majority of African Americans form a near perpetual underclass; that the nuclear family has detonated into pieces, leaving many children with only one parent, if that, to love, instruct and keep an eye on them; that the culture of instant gratification convinces kids that studying is a bore, while the infinitesimal chance of making millions as a pro athlete or a rap star is worth pursuing. Surely the young deserve full-time parents, more realistic goals and inspiring teachers. But maybe that too is a fantasy. Waiting for "Superman," Davis Guggenheim's edifying and heartbreaking new documentary, says that our future depends on good teachers  and that the coddling of bad teachers by their powerful unions virtually ensures mediocrity, at best, in both teachers and the students in their care. The movie's major villains are the National Education Association, the country's largest union, and the American Federation of Teachers. Posed against them are the film's heroes: Canada, whose Harlem Children's Zone schools give kids an intense, comprehensive intellectual and social education, and Michelle Rhee, another Harvard grad who as chancellor of the Washington, D.C., public-school system enacted stringent reforms, including firing many principals she thought were substandard. Canada is like the gifted proselytizer who sells a great idea, and Rhee is like the tough sheriff brought in to clean up a bad town. Guggenheim, who won an Oscar for the Al Gore documentary An Inconvenient Truth, might not have made his new film if, while taking his own children to their private school in Los Angeles each morning, he hadn't had to drive past several public schools that he and his wife had decided wouldn't suitably prepare their kids. What he found in his two years of researching Waiting for "Superman" (with co-producer Lesley Chilcott) was that a lot of schools aren't right for any kids  neither the dull ones who need gentle prods to move competently from K to 12, nor the underprivileged bright ones who could be the Geoffrey Canadas of the future, if only a good charter school had enough slots to accept them all. The movie concentrates on five of these children: Bianca, in kindergarten, and Francisco, a first-grader, both applying to the Harlem Success Academy; two fifth-graders, Anthony in Washington and Daisy in East Los Angeles; and the lone white child, Emily, an eighth-grader in Silicon Valley. Because the schools they hope to enter choose their new enrollees not by testing but by lottery, the futures of these and hundreds of thousands of other kids  their careers, income levels, social standing  depend on which ball falls into the hole. Pure chance will determine whether the answer is Bingo! or the abyss. Guggenheim may load his case by concentrating on children who are already passionate about their education; surely the vaster challenge is to enlighten the kids who think school is not paradise but a prison. And charter schools, which are promoted here as the enlightened alternative to the public-school system, have a record more mixed than the film suggests. So it's no surprise that Guggenheim has been the recipient of teachers' dirty looks. (Randi Weingarten, president of the American Federation of Teachers, has written about the flaws she finds in the film's generalizations.) But a documentary movie is not a dry treatise; certainly this one isn't. Guggenheim wants to start conversations, debates, elevated arguments  to get people thinking about a crucial problem whose solution has eluded Presidents and parents for the past half-century. Waiting for "Superman" stirs that discussion, and perhaps moves it to the front of our national concerns, because it is so smartly and feelingly constructed. The five climactic lotteries lend the film a mood of desperate suspense; the five children, especially Bianca and Daisy, give it dollops of heart. This is more than an Important Documentary: it is engaging and, finally, enraging  as captivating as any Superman movie, and as poignant as a child's plea for help. See photos from inside a public boarding school. See photos from a Mandarin school in Minneapolis.